Hub repaired, wheel rebuilt, well-rested and a few kilos heavier, we hopped on the Han River cycle path and headed for the countryside. 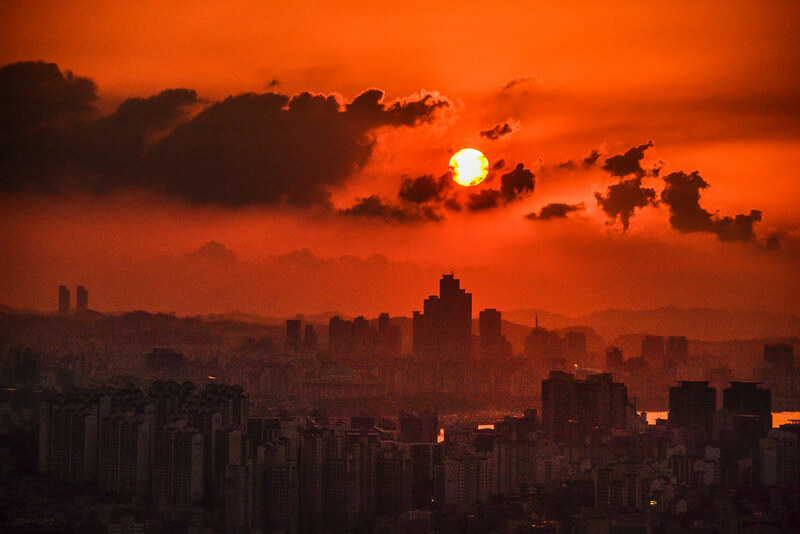 I’d taken in my final glorious Seoul sunset and a tinge of sadness swept over me as the city faded into the distance. Seoul had been home for two weeks. And that’s a long time for us to stay put. Time enough to settle into routines. To relax, to let go of the subtle stresses of finding water, the next meal and a safe place to sleep. A routine, every now and then, is grounding. It’s reassuring and comfortable. And quite necessary, I’d argue, if you’re in non-stop movement for months on end. Our Seoul routines were simple. We didn’t busy ourselves with tourist attractions from dawn till dusk. A walk up to Namsan Tower for sunrise started the day. It was a moment of solitude(Eric never accompanied me) and time to appreciate nature right in the heart of the city. My path never deviated. After two weeks of tracing the same trail, I could pick out which dogs would leap at me, wagging their tails in hope of attention and those that would snarl and let out a yelp spotting me as an imposter. My fellow walkers (all retirees– the rest of the population is too busy building a career or getting educated for leisure in the AM) nodded in recognition as we passed. It felt good to be one of the gang of early morning fitness nuts. Next came breakfast with our couchsurfing host, Jin Bu. We’d stuff ourselves with pancakes or French toast and then balance that with some healthier Asian fare. 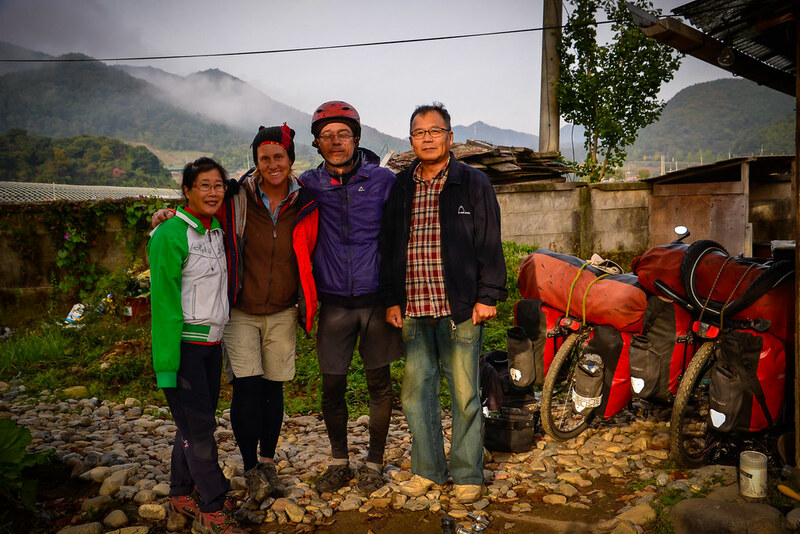 The days were filled with errands—arranging spare parts and parcels, repairing holes in the panniers and giving our much-loved tent a little TLC. Soon it was time for another hike up to Namsan for the sunset—now the path was filled with tourists chatting in a multitude of languages and snapping photos of each other with the capital spread out beneath them. US Army personnel from the nearby Yongsan base jogged in formation and young couples strolled hand in hand. Seoul has some of the most beautiful sunsets of any city in the world (although I’m told the vibrant color comes from an excess of pollution). After a leisurely dinner there was time to catch up on reading and then call it a day. Our hard-working couchsurfing host generally returned from her busy day at the office well after I’d gone to bed. Koreans are nothing if not industrious. 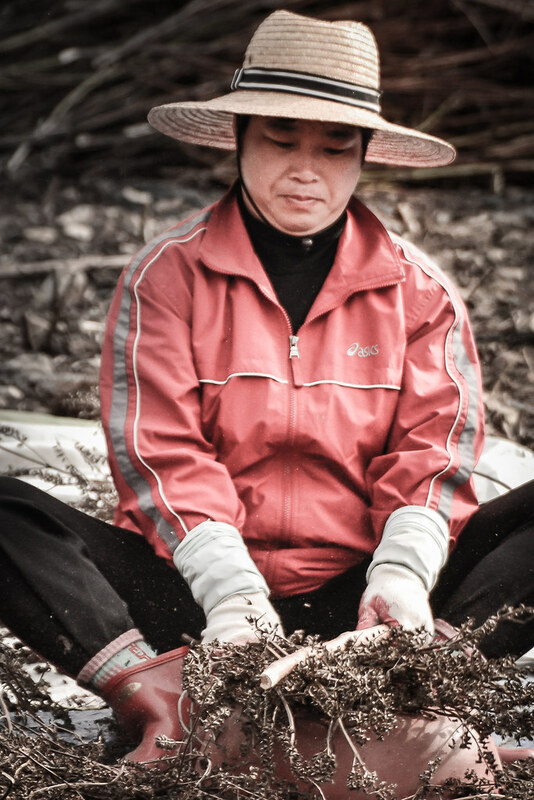 According to a 2008 ranking by the OECD, South Koreans work the longest hours per year, on average, of any developed country– 2,357 hours per year–that’s six-and-a-half hours for every single day of their life. Korea is moving forward at a frenetic pace. At least in the cities. The countryside is another world—and one, I might add, in which I feel much more at home. In total. we’ve been in and out of Seoul eight times. 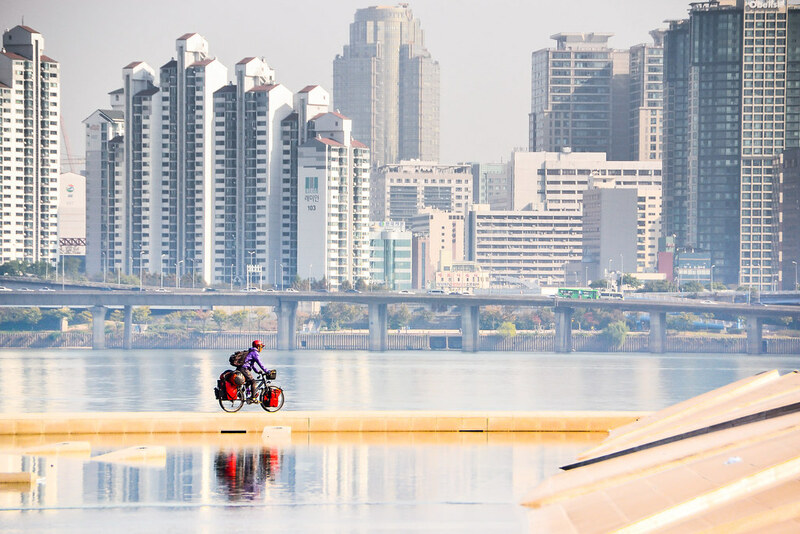 The Han River bike trail never fails to impress us with its amazing city-scapes and cool cycling culture–everybody’s on slick bikes dressed to the nines in the latest in cycling chic. We stand out like poor country cousins. Fall foliage in full force! Korea is awash with color in October. 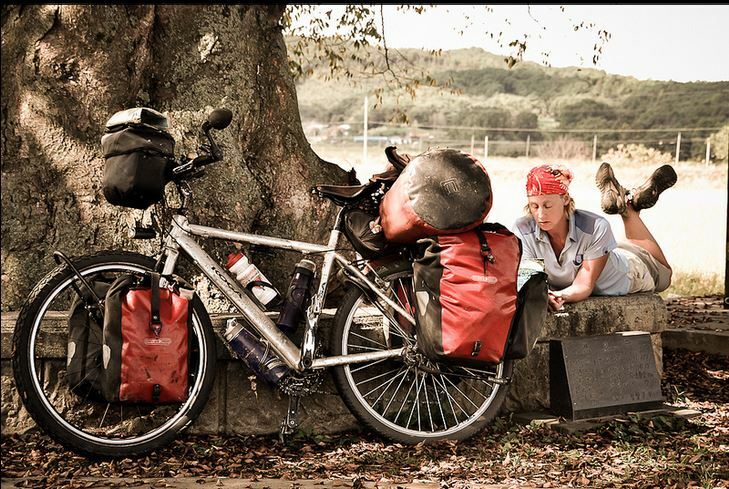 Autumn is probably the best time to go bicycle touring in Korea, although spring might be just as beautiful. 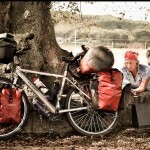 Avoid the hot and humid summers unless you are keen on sauna-style cycling. North of Seoul in Gangwon near the DMZ we came across military bases every 20 kilometers or so. Plenty of tanks cruising down the highway and even this regiment of young recruits out for a training march. They were fully armed and looked rather fierce until we settled down for lunch together and posed for this parting shot. Korea’s northernmost province is so lightly populated compared with the urban coastal centers it’s something like comparing Montana with Massachusetts. If you stick to the minor roads and don’t mind a steady succession of hills, you hardly need to plan a route. 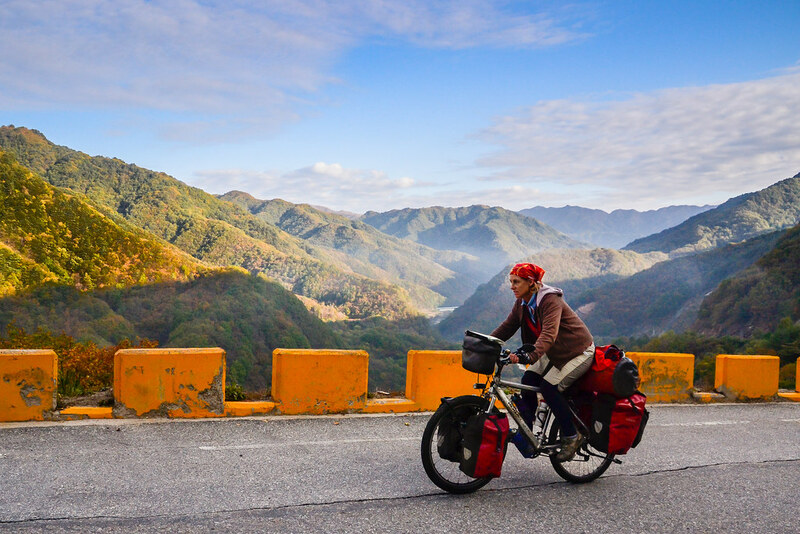 We wandered over mountains and up valleys all over Gangwon province and never tired of the colorful mountains and peaceful roads winding along the river banks. 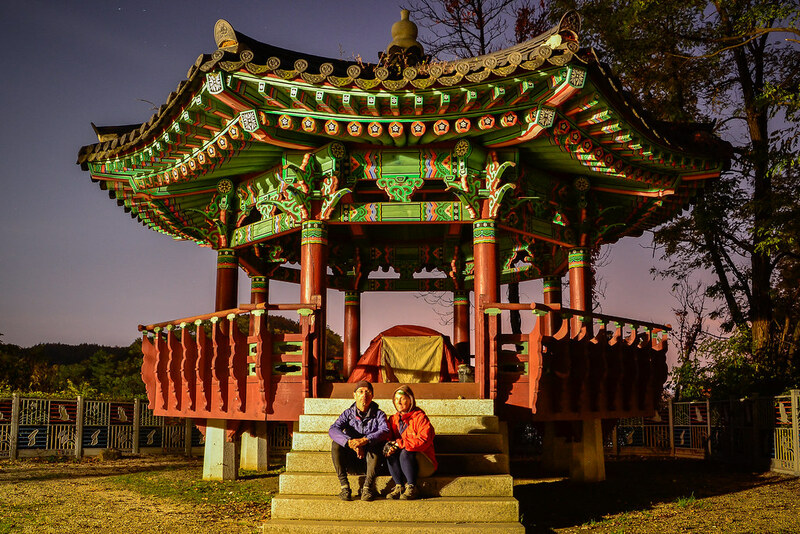 We had no problem tracking down cozy camping spots like this one in Cheorowon at the Goseokjeong Pavilion (remember: arrive after sunset, set off at sunrise, and leave no trace). This region is smack dab on the border with North Korea and actually changed hands several times during the war. When we visited it appeared as if military training exercises were taking place. The sounds of the the birds chirping were often drowned out by helicopters and attack aircraft buzzing overhead. We also heard distant explosions that sounded like rockets being fired off. Perhaps not the best area to do wild camping. I still find it hard to reconcile the ultra modern life in Seoul and other urban centers with what I see in the countryside. Here much farm work is still down by hand and it’s like stepping back in time. It’s cold way up north and Koreans often took pity on us and invited us in for the night. A common question was, “How can you survive at night?” Well, it really wasn’t that bad, just a touch below freezing at higher altitudes. Of course that doesn’t mean we turned down hospitality! 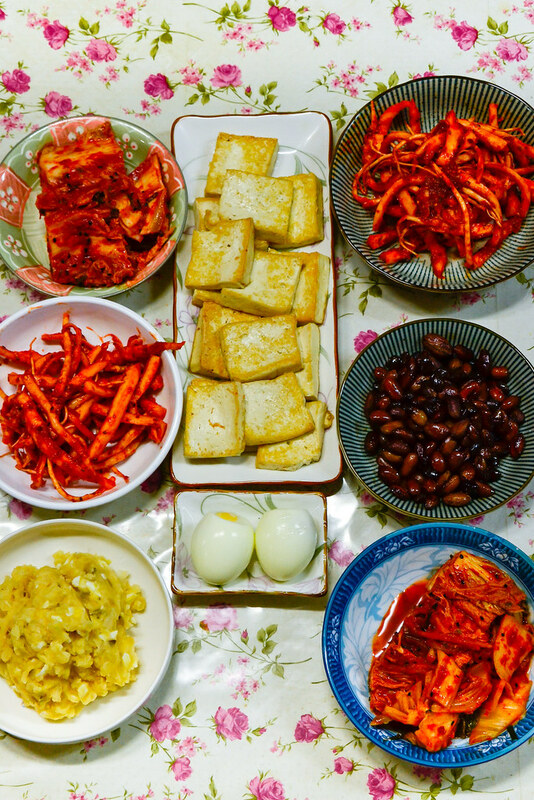 Korean breakfasts are bountiful and certainly beat our staple pancakes! 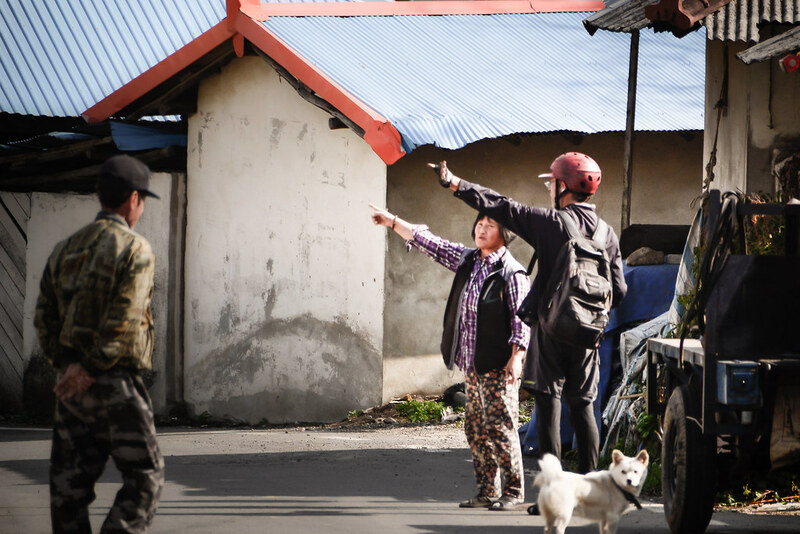 Korean women are famous for looking after their family’s every need and this carries over into the way they treat guests. One day we informed our host (who’d taken us in spontaneously the night before) that we would leave at 6 AM insisting that it would be too early for breakfast and begging her not to get up early. Of course she didn’t listen and a full spread awaited us before we set off for the day. 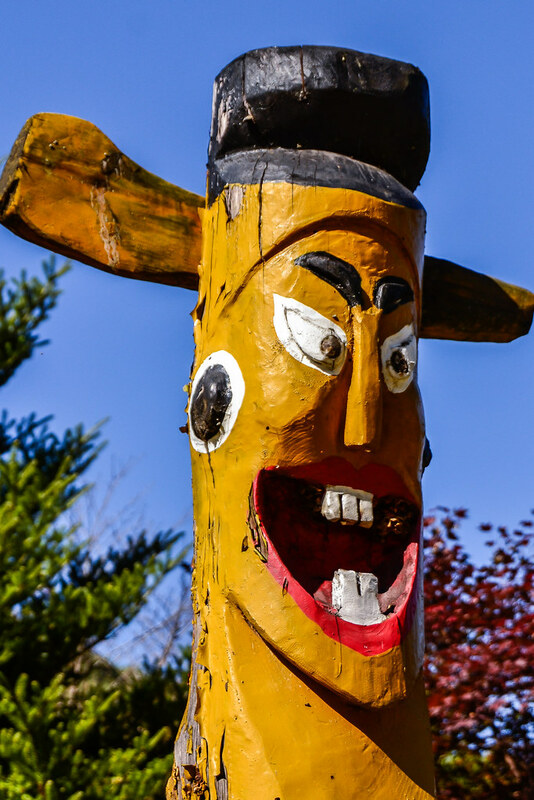 This is a jangseung or village guardian– it’s a kind of Korean totem pole. Traditionally, the jangseung frightens away demons and marks the boundaries of a village. It seems some of the roads marked in our atlas no longer exist or maybe it’s just our Korean map reading skills. We ended up having to backtrack on more than one occasion. Korea is home to 21 national parks, which is a lot considering that the entire country is less than a third of the size of my home state of Montana. 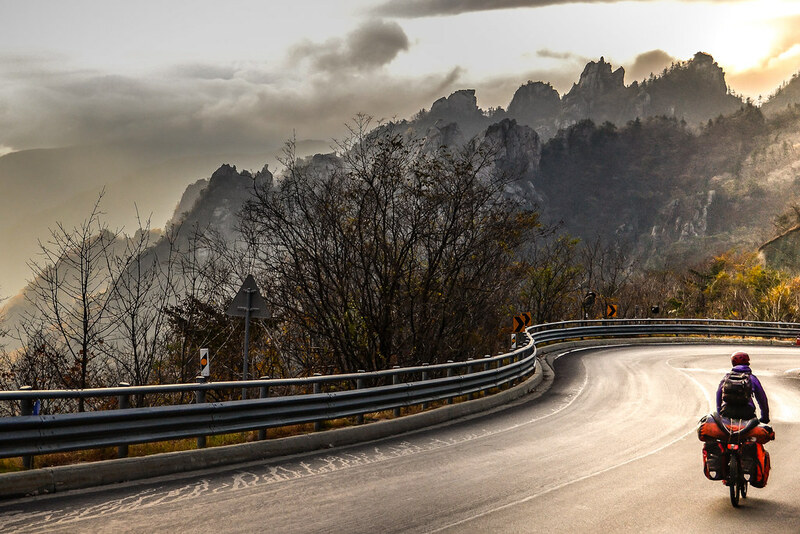 If you’re a nature lover, Korea is a country for you. Seoraksan, where I snapped this photo, is the most popular park. The mountain was named Seorak (‘Seol’ meaning ‘snow’ and ‘Ak’ meaning ‘big mountain’) because the snow would not melt for a long time keeping the rocks in a perpetual state of white. It’s BEAUTIFUL! We spent a chilly night on the top of the mountain and raced down to beautiful views not long after daybreak. Our most memorable day in Korea. We are back in Busan now, exactly where we began our tour two months back. Tomorrow a Cebu Pacific flight will whisk us off to the Philippines. I reckon we’ll be in for something like culture shock. If you’re planning a trip to Korea, check out the KTO’s excellent website. 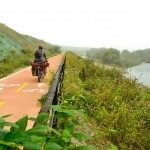 To plan your bicycle touring route in Korea, visit the official 4 rivers bike trails site. 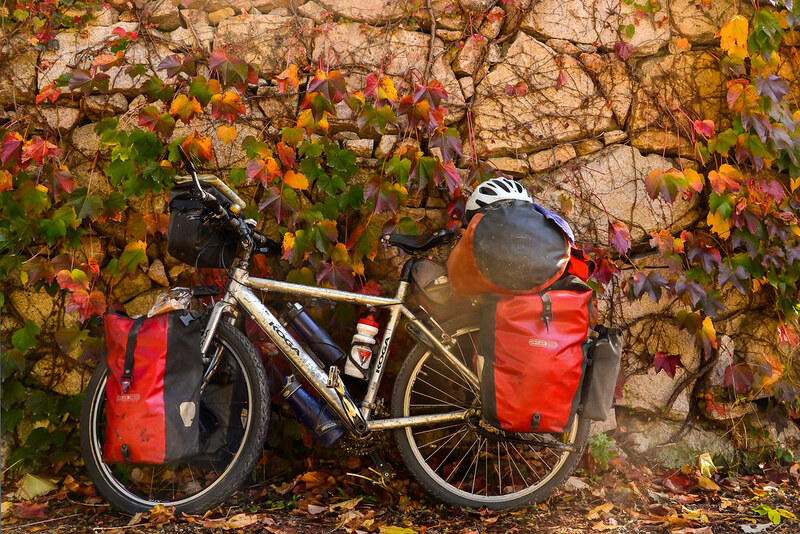 For more images of bicycle touring in Korea, hop on over to our Korea Bicycle Touring Flickr Set. Looking forward to your adventures in the Philippines. Oh, can’t wait to go there! 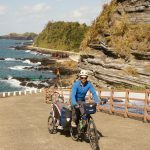 After wonderful cycling in Japan I discovered lately, also thanks to you guys, that Korea has so much to offer. Was about to go there in October but finally decided to go there during my World Tour that starts soon in December in.. the Philippines! :). That would be great to see you guys on the road. will look forward to your news, best! Great report on Korea… definitely one to do for me! Looking forward to reading about the Philippines. Hopefully with Super Typhoon Haiyan heading to the Phillipines you are making yourselves safe and not on some isolated road in the countryside. 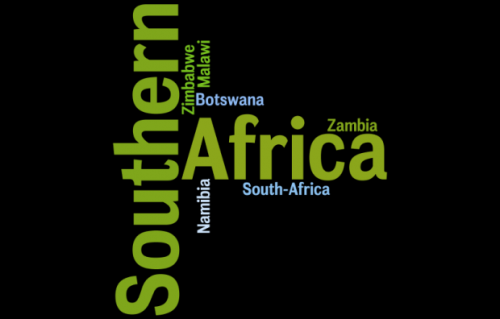 Hoping to hear that you are safe and sound soon!